The Mulanje Massif, also known as Mount Mulanje, is a large monadnock in southern Malawi near the city of Blantyre, rising sharply from the surrounding plains of Chiradzulu, and the tea-growing Mulanje district. It measures approximately 13x16 miles (22x26 kilometres) and has a maximum elevation of 3,002m at its highest point, Sapitwa Peak. Much of the Massif consists of rolling grassland at elevations of 1800-2200m, intersected by deep forested ravines. It has many individual peaks reaching heights of over 2500m, including Chambe Peak, the West Face of which is the longest rock climb in Africa. The Massif was formed by the extrusion of magma into the Earth's crust about 130 million years ago. 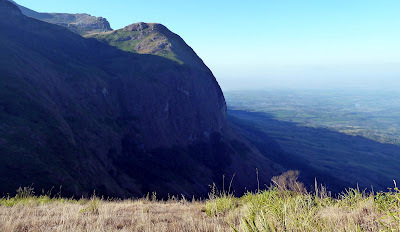 The surrounding rock eroded away over time, leaving behind the erosion-resistant igneous rock of the Mulanje Massif. The first European to report seeing the Massif was David Livingstone in 1859, but archeological investigation reveals evidence of human visits to the Massif from the Stone Age onwards. The elevation of the mountain is high enough for it to disturb upper level air flow and induce rain clouds to form around it, making it an important source of rain water at the head of almost every river that runs through this part of Malawi. The forested slopes of the Massif support a sizable timber industry. At one time there was a cableway to transport timber from the edge of the plateau down to the Likhubula Forestry Station, but it fell into disrepair, and currently planks are carried down manually. 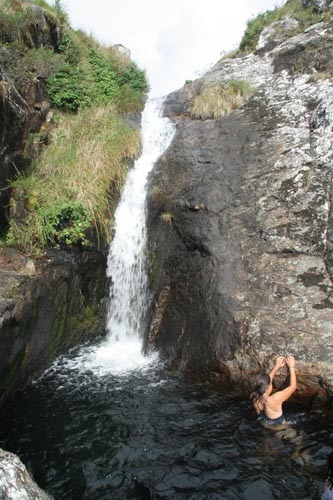 The mountain itself is part of the protected Mulanje Mountain Forest Reserve. The native Mulanje Cypress (Widdringtonia whytei) has been so heavily logged that it is considered endangered and the park contains the last remaining stands of this tree, as well as a number of other plant and animal species—many of them endemic to the area. Examples include forest butterflies, birds such as the cholo alethe and White-winged Apalis, a dwarf chameleon, geckos, skinks, the Squeaker Frog, and a rare limbless burrowing skink species. The land around the park is threatened by growing population, land use patterns such as forest clearing for farming and firewood, and invasive species such as Mexican Pine and Himalayan Raspberry. The Massif is popular for hiking and climbing, and has several mountain huts scattered across it. Sapitwa peak was first climbed in 1894, and is now the most popular climb on the plateau.